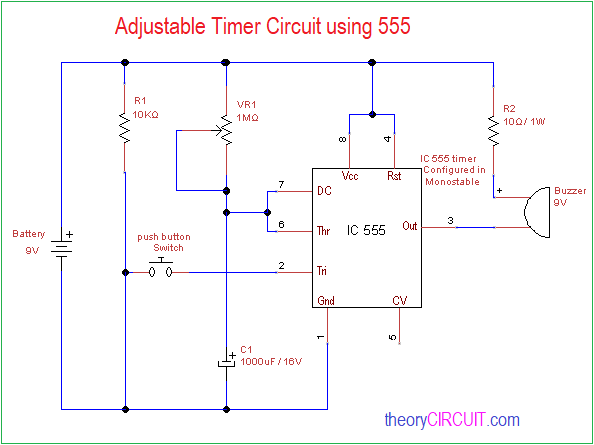 Simple Adjustable Timer Circuit using 555 timer IC constructed to give alert sound for variable time limits, this circuit constructed as a monostable multivibrator and gives only one pulse for the time limit. This circuit has two timing elements VR1 and C1, here we can change the time duration of output pulse with the help of VR1 Resistor. This Adjustable timer circuit using 555 has buzzer as an output element and starts to produce a buzzer beep sound when the output goes low. To construct the timer IC 555 circuit as a monostable multivibrator, the trigger pin should be connected to the ground supply through the push button switch. When the push button switch pressed the trigger pin gets negative supply and triggers the timer IC 555 operation. Timer components VR1 and C1 are connected across the power supply and discharge pin 7, threshold pin 6 are combined and connected to the timer elements. The output is connected to the 9V buzzer element through a 10Ω Resistor. Pin 8, 4 connected with 9V battery positive, pin 1 connected with 9V battery negative supply. By varying the VR1 value we can adjust the output time limit, Calculate the output time limit before implementing the circuit on the field. Test the time limit and VR1 value and make a label or mark on the circuit to select multiple time duration alert.